Most of my blog posts are about the industry: how to do things, what works and what doesn’t, what’s new in the tradeshow world and so on. But I rarely get personal on this blog. It’s not necessary, but on occasion it is kind of fun for readers to see who’s behind it all. Given that, I thought it would be worth it to explain exactly how I got here, and how I run my business. I spent 26+ years in the radio industry as a DJ, Music Director, News Director/Anchor, Program Director (and more), but as the industry changed (technology, mainly), I found that positions in the industry were getting squeezed, and a lot of talented people were having a hard time finding a spot. I loved radio – still do, in fact, as a volunteer doing a weekly two-hour reggae show on KMUZ in Salem – but to make a living in radio just wasn’t feasible anymore unless I wanted to be a gypsy and take my small family with me to where the jobs were at any given time. No thanks, I like Oregon and want to stay. The Exhibit World is a Thing? As to how I got to the tradeshow world, I literally stumbled into it. With two young sons, I was working as an assistant manager trainee for Hollywood Video, when a family friend’s wife saw me at the checkout counter. “Training to be an assistant manager!” I said proudly (biting my tongue and crossing my fingers behind my back). The next day her husband called me. “Sure,” I said. Couldn’t hurt. Might even be interesting. We sat down a couple of days later and chatted for an hour. Ed Austin, the owner of Interpretive Exhibits, talked about the exhibit industry – both interpretive and tradeshow – and how their small company fit. As the hour drew to a close, Ed Austin, the owner of the company, offered me the job. 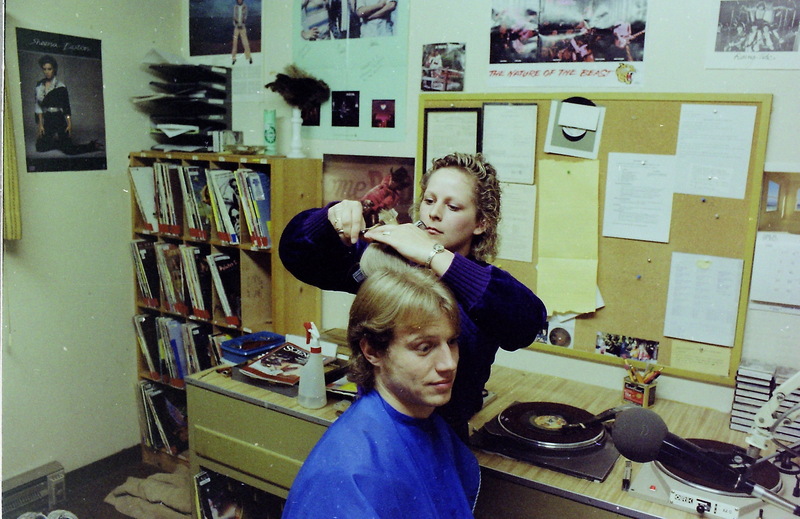 “I didn’t really plan on offering you a job at this point, but you have good people skills, a lot of other good skills, and we can teach you about the industry.” His offer doubled the money I was making at Hollywood Video, so it was a no-brainer. Exhibit industry, here I come! Hollywood Video, by the way, was a victim, like Blockbuster Video, of the revolution in streaming video. For the next several years, I slowly learned the exhibit industry. The biggest cultural shift and change to my daily work was the fact that in the exhibit industry, compared to the radio world, things moved slowly. Glacially. In the radio world, I’d get an order to write and produce a handful of commercials, due in a day or two. Three or more days if I was lucky. Once you got the order submitted, you had to jump on it. Or in the case of news reporting, it was non-stop. You were always hopping to find the next story, or to get the latest on a story that was active. I found that in the exhibit industry, though, especially when it came to interpretive exhibits, there were usually a lot of parties that needed to chime in on something. Once a discussion or meeting was complete on a topic, the next step was usually weeks away before anything was due. Weeks! Sometimes a month or two, before the next step was due, and the various parties had to chime in. I couldn’t believe it. I was so used having to jump, it took a long time to adjust to the glacial speed at which interpretive projects unfolded. In a sense, I found it boring, because I was always looking for something for my ADD brain to do (more on that later). We did projects for the Army Corps of Engineers, National Forest Service, Oregon State Parks and many other government and non-profit agencies. An earlier salesperson had ended up selling a large exhibit to a large corporation, and the company knew there was business to be had there, but frankly, corporate work was foreign to the management. They were used to going onsite to a muddy natural area and chatting with like-minded people. They were not used to putting on a nice sport coat and meeting potential tradeshow clients. Which became my task: find some tradeshow clients. Sell some tradeshow exhibits. Get on it. What’s VP of Sales and Marketing Do? After a few weeks at the company, it came to my attention that the company website sucked. Given my need to have something useful to do (I knew almost nothing about sales at that point), and since I had put up a handful websites, I offered to at least oversee a makeover of the website. Which I did, which they loved. And with the title of VP of Sales and Marketing, I was given free time to do things other than just sell exhibits. I also knew that I needed more information on the industry, so using my radio skills, I set up interviews with industry consultants, writers and experts. The interviews were recorded and posted on the website (this was before podcasting was invented – I just found a way to embed the audio). I also wrote articles based on things I had learned and posted them on the website (again, this was before blogging software found its way into the world). I eventually compiled about an hour worth of recordings and created an audio CD which I gave away, calling it something like Inside Secrets of Tradeshow Marketing. I put it on the company site for something like $79, but where it was really useful was giving it away to potential clients (complete with a $79 price tag). 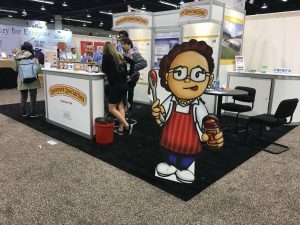 As for tradeshow exhibits, I had a friend at Kettle Foods in Salem (employee number 8, I think), and asked if they did any tradeshow marketing. Turns out they did. Turns out they were shopping for a new one. 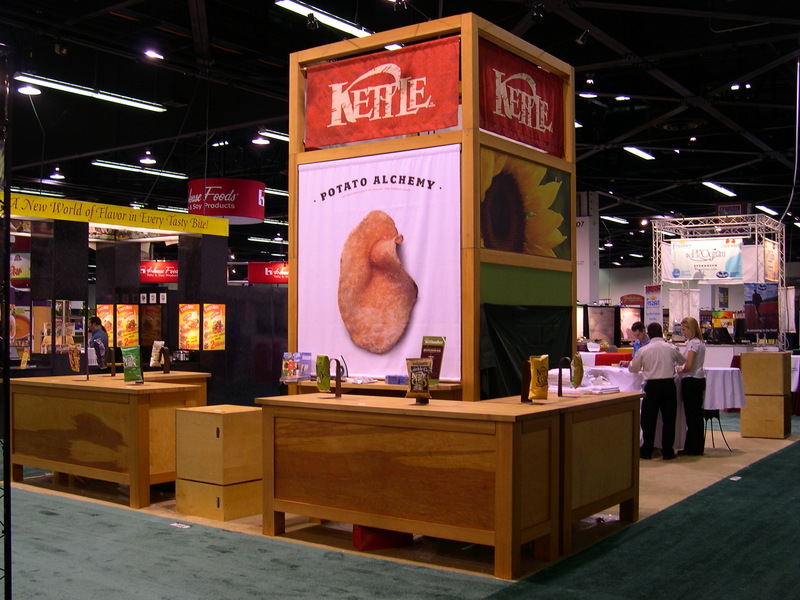 We made a pitch, and they spent $25,000 on a 20×20 custom exhibit that made its debut at Natural Products Expo West in 2003. Ed told me years later that the $25,000 job cost the company about $40,000, so it was a money loser. But we kept showing it off and it kept leading to new clients, so I figure it paid for itself many times over. In any event, we were off and running. The Kettle Foods exhibit led to a connection with Nancy’s Yogurt (10×20 custom), Hyland’s Homeopathic (10×20 custom, which was designed, fabricated and shipped in 35 days flat, I kid you not! ), and Bob’s Red Mill (custom 20×20). We did a custom 30×70 for local spa manufacturer Marquis Spas. We did exhibits for Mountain Rose Herbs of Eugene (still one of my favorites), BioKleen of Vancouver. The most interesting sale I made, though, was on a flight back from DC to Portland. I was catching a connection in Denver, and the woman next to me ended up sleeping most of the way back from DC to Denver. As we were coming in to Denver, she woke up and we chatted a bit. I asked what she was doing in DC and she said she had been at Expo East. I had too! I told her what I did, she took my card, I got hers, and a short time later we did a new custom booth for Natracare, from England, but with American HQ in Denver. It proved to me that there are opportunities everywhere if you keep your eyes and ears open and aren’t afraid of piping up. Somewhere along the way, an old radio friend has asked me what I was doing now. “I’m in the tradeshow world!” I told him. He said, “Oh, you’re a Tradeshow Guy, eh?” Somehow that name stuck. In late 2008, I was curious about the new whiz-bang online publishing platform of blogging, and started TradeshowGuy Blog, just wanting something to play around with and as a creative outlet. It’s been going ever since. The recession in 2008/2009 did a number on the tradeshow exhibit building world. 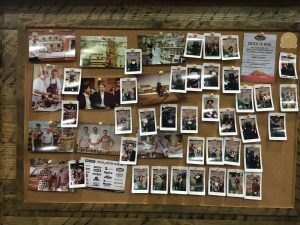 Many companies that we knew of in Portland closed. Others consolidated or downsized. Interpretive Exhibits’ secret weapon, I thought, was that we were small. We managed to keep a handful of people on salary and bring in the fabricators when projects warranted. But Ed was nearing retirement, and in 2010 told us that he would close the company down in 2011. Which he did on July 15, 2011. My last day at Interpretive Exhibits. Not really knowing which way to turn, I thought I’d keep in touch with some old clients while I collected some unemployment, took some time off, and looked for another job. Which I figured I would get at some point. But it never happened. Being in your mid-50s and looking for a new job is not a fun exercise to say the least. And along the way, I did have some previous clients order some new things. Not a lot, but enough to make me think that I should stick with this entrepreneurial thing. In the meantime, prior to Interpretive Exhibits closing down, I had teamed up with Roger Pike, an old radio friend in town. We had shopped ourselves around as public speaker trainers and social media consultants. We got a couple of clients, the biggest of which was a local employers association that hired us to do a twelve-week training for their presenters. This was in Roger’s wheelhouse (not mine), as Roger was (and is) a great public speaker and former college public speaking champion. Lots of fun, but as time went on I kept putting more of my energy into selling exhibits (which was about to turn more profitable), and eventually left the consultancy with Roger behind. That’s because in 2012, Bob’s Red Mill decided that their current 20×20 was going to be phased out and would I be interested in helping them do a new 30×30? Of course. I contracted designer Greg Garrett, whom I had known while working at Interpretive Exhibits, and had him create a design. Once the design was approved, I shopped it around to three fabricators, and Classic Exhibits in Portland ended up getting the job. Even though they were known as more of a modular ‘kit’ builder, they were stretching their wings and were hoping to become more known as a custom builder. This project suited that desire perfectly and they did a fantastic job on the booth if I may say so. That job convinced me that I could make a go at owning my own company. Roger Pike and I had called our company Communication Steroids, figuring that it was clever enough and descriptive of what we were doing. I named my exhibit company Communication One Exhibits, not that clever or descriptive, but what the hell, I thought. Over the next few years, 2011 – 2014, I did a couple of larger projects, many small ones and kept the mortgage paid and the mouths fed. And I found I was having fun working for myself. In fact, I really liked it. By late 2015, I had mentioned to Mel White, VP of Business Development at Classic Exhibits, that I didn’t like the name Communication One Exhibits, and he suggested I use TradeshowGuy Exhibits, since I was the TradeshowGuy online anyway! After a little thought and discussion, I did away with the old name and brought in the new one. I kept looking for ways to generate more leads, make connections with prospects, and show off my growing expertise in the industry. I had done a handful of speaking gigs, both while with IE, and with my own company, and while I liked it, none of it lead to any significant new clients. I finally put my head down and finished a book that I’d started on at least three times. The book, Tradeshow Success: 14 Proven Steps to Take Your Tradeshow Marketing to the Next Level, came out in late 2015, and I immediately used it as a ‘business card’ with potential prospects. 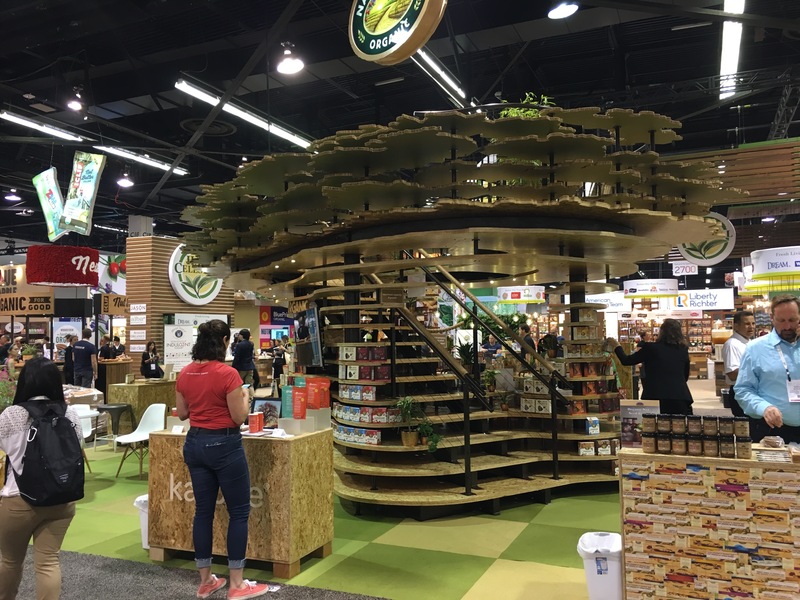 It didn’t automatically get people to buy, but it was certainly something that almost no other exhibit house or exhibit salesperson could offer. In 2015, I went back to doing webinars on a regular basis, even securing the URL TradeshowGuyWebinars.com. 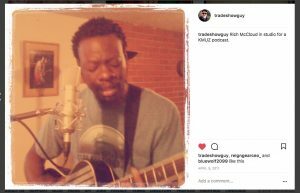 I did them monthly, but after a year decided that I wanted to do a more regular podcast, which led to the TradeshowGuy Monday Morning Coffee which launched in January 2017. My goal was to just BE THERE on a weekly basis, to talk about things that interested me in and out of business. I’d have guests, but the guts of the show didn’t ride on having a guest. 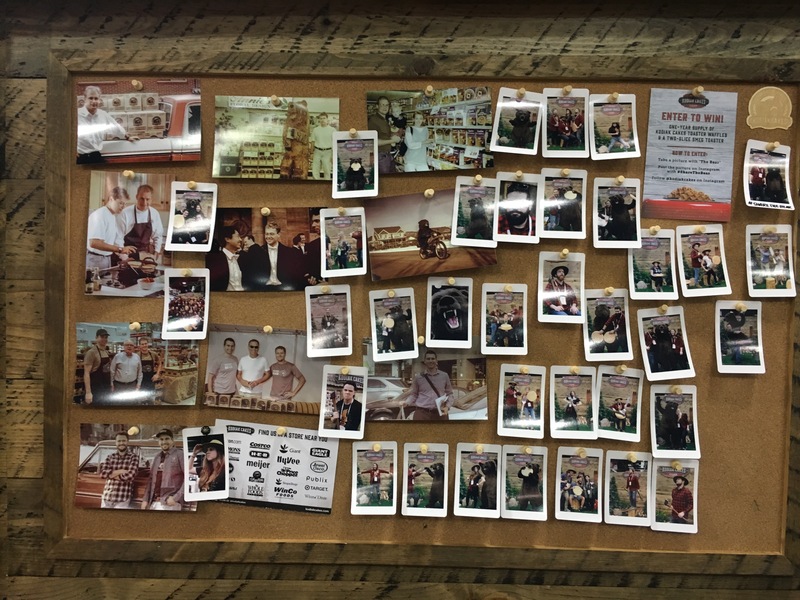 I’ve had a lot of guests (you really should browse this blog to find them! ), they were all terrific and had fun stuff to share. But I have as much fun putting short podcasts or mini-films together, too, when it seems right. In 2016, I felt my sales skills – which had grown a lot since my entrée into the industry in 2002 – needed some help. I had joined Tip Club in Portland, a networking group run out of Brad Kleiner’s office in Wilsonville. Brad was a Sandler Sales trainer, and after learning more about what and how he taught, I joined his President’s Club weekly 2-hour sales training group for a year. Best sales training I’ve ever run across, and it gave me a great set of tools on how to prospect, uncover pain, close and service the deal. Rejuvenating! 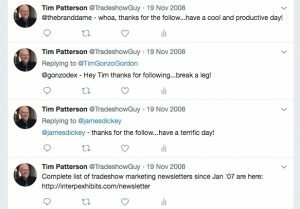 Another item had come up a few times – the use of the name TradeshowGuy. Once someone asked me if I had trademarked it. Uh, no. I looked into, and found it surprisingly easy. And pretty reasonably priced, too. It took several months, but in late 2017 I got confirmation that the trademark went through. So yes, it’s registered now. I’m officially TradeshowGuy and the company is known far and wide as TradeshowGuy Exhibits. As we reach the middle of 2018, I look back and see that I’ve been running my own business for seven years now, and it’s doing better than ever. It’s not easy, it’s not predictable, but it’s been rewarding and fun. And I really do work at it. I like working with clients – that’s probably the most rewarding thing, seeing their reaction to a brand-new exhibit that will go out into the public and represent their company, products and brand. Great feeling. 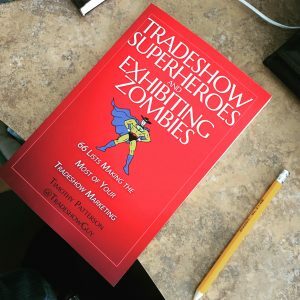 They say that the best way to sell your book is to write another one, so in late 2017/early 2018,I compiled several dozen lists that had been published on this blog and released my second book, Tradeshow Superheroes and Exhibiting Zombies: 66 Lists Making the Most of Your Tradeshow Marketing. Who knows how far this thing goes? I figure if I can get another seven years out of the business, I’ll consider closing it down. After all, I’ll be 70, and may want to do other things. But hey, I still jam on my guitar, still bash my drums regularly, do a fair amount of hiking, bicycle riding and walking. I’m planning to live to be 120, so I have a way to go, amiright? Since social media has become such an integral part of today’s online world – what would you do if you had to withdraw from Facebook, Instagram or LinkedIn? – I think the approach to how it is effectively used has changed. And it comes down to a number of factors. I’ve been thinking recently about how my use of Twitter, Facebook, Instagram and LinkedIn – and to some extent, YouTube – has changed over the years. Thought it might be fun to spend a little time going over that here. Let’s start with a recent change. When I first got onto Instagram, the name TradeshowGuy was in use, so I picked TradeshowExpert and moved on. Last year, in the process of registering TradeshowGuy as a trademark, I looked again and discovered that TradeshowGuy was no longer being used on Instagram, so I grabbed it. Figured the more accounts I could get with that handle, the better. I use the TradeshowGuy handle on Twitter, Instagram and Pinterest. And have my eye on at least one more. Back before we called it social media, we called it “Web 2.0,” which as a usable term was doomed from the start. I had heard about Facebook, and joined on June 1, 2007, when there were just over 20 million users. Yeah, I know, right? 20 million! For years, I had just a personal account with Facebook, but eventually created a number of organization pages, including TradeshowGuy Blog on Facebook. I tend to not post a lot to that page, because it’s never gained much traction, with only 355 current followers. My newsletter automatically posts to the Facebook TradeshowGuy Blog page, and a few other items, but it’s lagging in my attention. I joined Twitter on November 19, 2008. 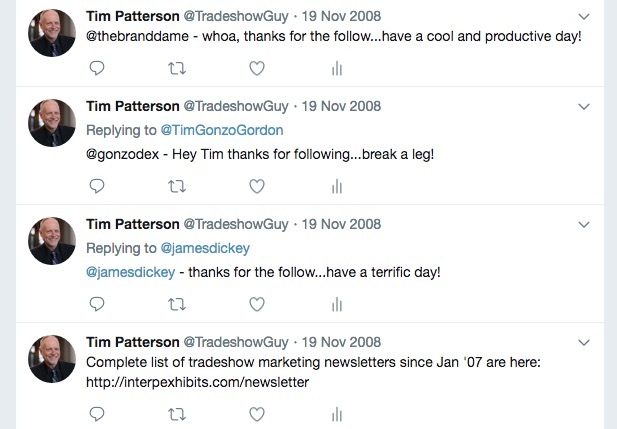 That’s when I first used the TradeshowGuy handle. It’s one month before I first posted on this blog. The first blog post came about when I interviewed Magic Seth for an older podcast that I was currently doing. The podcast was very random, with no rhyme or rhythm. Twitter took a little getting used to. Today on Twitter I jump in and out, and admit it’s my most-used platform. I’ll frequently use Hootsuite to schedule about 3-4 daily tweets, focusing on a mix of promotion of blog posts, videos, podcast, products and some totally random fun stuff. When I’m “live” and not putting out scheduled tweets, they usually are a mix of personal photos, retweets, links to articles I’ve found in and out of the tradeshow world and things that just interest me. And of course, when people respond or like tweets, I try to acknowledge them with an upbeat response. I also admit that when I just want to zone out and scroll through some social media feed these days, Twitter is my game of choice. It edged out Facebook a couple of years ago. I signed up for a LinkedIn account on April 17, 2006. LinkedIn is a good platform for engaging with connections and entities and people you follow, and for letting people know about new blog posts, podcasts and videos. Engagement is modest, but it seems to be consistent. To me it’s all about presenting yourself as a likable, easy-going person (because that’s what I feel I am!) and avoiding religion and politics. In today’s fractured tribal world, I’ve found through experience that if you post a strong political opinion it can blow up in your face. And it’s typically unpleasant. For that reason, I stick to business. Instagram, being a visual medium, is also great for business and personal. Given that the account has the TradeshowGuy handle, I do tend to toss a lot of business related photos up, but certainly not exclusively. My friends and family know me as TradeshowGuy, so it works both ways. And as I learned a loooong time ago, you really can’t keep your personal life and business life separate, no matter how hard you try. The YouTube Tradeshow Marketing channel is used (almost) exclusively at this point for posting the video versions of my podcast. I do use it for other types of videos, but only sporadically. I took a look and see that my first video was posted November 2, 2008, right around the time I started this blog, got on to Twitter and more than a year after I joined Facebook. I am a little surprised that the first video has over 1,000 views! You’ll also find how-to videos, and some fun stuff in there as well. Pinterest is my least-used social media platform, and I think that’s a bit of a shame, because when I do go there, I like it quite a bit. I occasionally will add pins to the various boards I have, many of which revolve around technology, music and movies and other fun things. I have noticed lately that there are almost 6,000 views of the various pins I have, so maybe I should spend more time there! But in my experience, creating new pins by uploading photos is a bit tedious, which is probably why I shy away from it. Overall, while I’m still pretty active on social media, I’ve pulled back from my busier online days of 2010 – 2012. In fact, back then, this blog focused solely on blog posts about how to use social media with events, conferences and tradeshows. After a ton of articles with just the social/event focus, I opened it up again to the wider world of tradeshows and events. I think social media is important, and when I’m at an event, I’ll make sure to post a least a few things on a handful of platforms. I’ve found that Twitter is the go-to for most event-goers, and Instagram is a strong second. It’s easy to include hashtags, easy to share, easy to search, and generally a cleaner look than Facebook. What about video? I use pre-recorded video regularly on the vlog/podcast, as you probably know. But here in 2018, live video is how a lot of people roll. You can hardly go a day or two without seeing some famous person such as Gary Vaynerchuk or Peter Shankman doing a live video on Facebook or Twitter or Instagram. I’ve done a handful, but my preference is recorded. Live video is fun, but it’s not really in my wheelhouse, and unless I’m on the road and have something interesting to talk about, I’d rather not just do live video of me, you know, having breakfast or something. Like some other people! But I expect I’ll do more live video as time goes on. The most important online real estate you can have as a business, whether small or medium, is a blog. With all of the other platforms, you don’t own the platform. Rules can and do change, and those changes can have a big effect on how people find you or interact with you. And if you do something against their rules, you can find yourself closed out of your account, and you have to fight to get back in. Doesn’t happen often, but it does happen. With a blog, you are leasing a service which hosts your blog, but you own the content, and you control how it looks. Does it work? Yes, to a degree, but blogging and using social media doesn’t automatically bring new business in. In 2016, fully two-thirds of my company’s business came from people that found me online. It hasn’t been that significant since then, but to me, being out there on social media, and regularly creating content on a blog is one of the best and cheapest ways to be found online – and when people are ready to buy, they go looking for someone that can solve their problems. The bottom line to a successful social media program is to understand three things: realize that it’s a never-ending task, that you have to be yourself – even if you’re representing a company brand – and that you have to engage. That means responding when people comment or ask questions. And don’t wait a day or two or a week. Respond as close to real time as you can. Got a tradeshow appearance coming up, but aren’t sure how to exactly get people to come to your booth? Maybe you’re tried emailing people, or spent a lot of time leading up to the show and during the show pitching things on social media but aren’t getting great results? 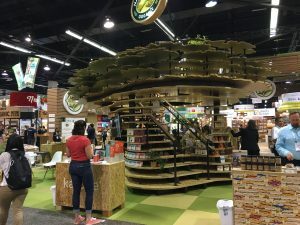 It doesn’t mean that you aren’t doing it right – there are a lot of reasons why things either work or don’t work – but one thing that doesn’t seem to be used a lot these days is sending out snail mail promos to get prospective tradeshow visitors to your booth. So let’s create a list of seven items that you should consider sending out, in order, prior to the show. Keep in mind, this will cost more than email. In fact, depending on the things you send out, you might kick up a pretty noticeable budget. But for argument’s sake, let’s say you’ve got the budget and want to really get people’s attention. A NOTE: This will take quite a bit of planning and coordination. You’ll need to sit down with a graphic artist, your product development team to know what new products will be launching, perhaps an outfit that coordinates mail promotions – lots to think through, but I think it’s worth taking a hard look at how this may unfold and get a lot of people excited to come to your booth. I mean, snail mail! Pull it off right and you’ll have a lot of folks looking forward to coming to your booth. Postcard Teaser Number One: Send this a few months, say 14 weeks prior to the show. On the postcard, do a “Save the Date!” tease, with the dates, times and location and bare bones information about the tradeshow, including your booth number. Nothing more. Just a teaser. Postcard Teaser Number Two: Send this one about 12 weeks prior to the show. Change out the “Save the Date!” verbiage with a little more information. Be sure to include the details (show, dates/times, booth number, etc. ), but add some more information. If you’re launching new products, tease that. Doesn’t mean you have to give away all the information, just let people know that you have X number of new products that they’ll be among the first to know about if they come by your booth at the show. Letter: Send this about ten weeks prior to the show. It’s more than a postcard, this could be a flyer or letter that does the basics (show dates/times, booth number, new product launch, etc. ), but invites them to go online and answer a 2-question survey for a chance to win something. OR…you may invite them to go online to a specially created landing page where they can sign up for an appointment with one of your representatives. The purpose of this email is for your prospect to consider making some sort of commitment to come to your booth. Postcard Invitation to Pick Up a Gift: Send this eight weeks out from show time. This is one you can have a lot of fun with, but you’ll want to be careful as well. You might approach it this way: tell your recipient that you have a limited amount of branded tumblers or some other nice special gift – but the only way to get one is to either be one of the first 100 people by the booth on day one OR they can confirm an appointment and you’ll reserve the gift for them. Work with your promotional products expert to come up with something that fits your budget and also the number of guests you suspect might be able to make that commitment, depending on the size of the show. Postcard reminding them of EVERYTHING: Send this just six weeks from the show. Tease your appearance, the new products launching, their chance to get a great prize if they book an appointment or are one of the first 100 to the booth. Postcard or Flyer: Send this a month prior to the show. if you have a new exhibit that you’re going to show off, let people know that it’s going to be special. In fact, you might send out a teaser image (3D rendering or photo-in-progress) showing off a part of the exhibit. Postcard Reminder: With just a couple of weeks to go, send out your last piece of snail mail. This could be a reminder or the various things you’ve already sent. If you’re planning to be active on social media, include mentions of all of your social media platforms and include any special hashtags that you’ll use during the show. 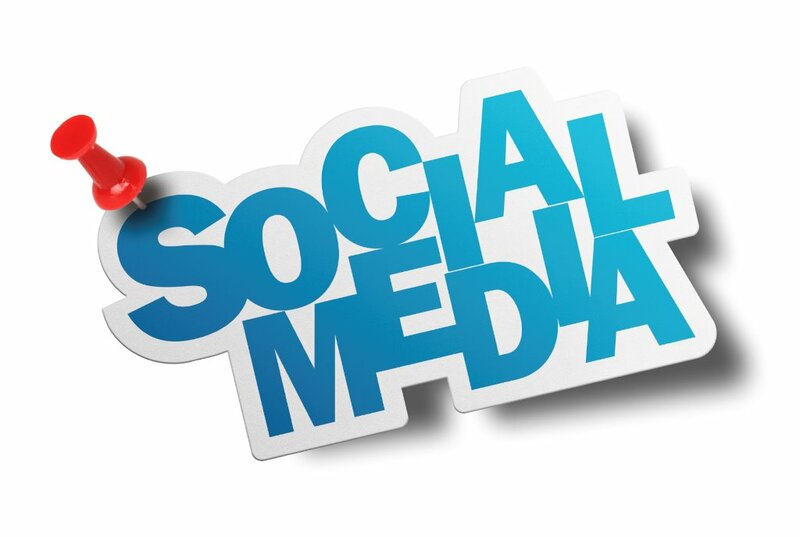 If you’re doing a social media promotion, include that here. This is a mere outline with a handful of suggestions. 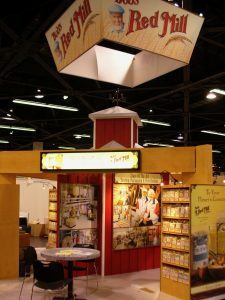 Get your creative juices flowing and figure out what items you can promote to get people to visit your booth. Maybe someone from your company is speaking or participating in a panel. Maybe you want to try some form of the “glove” promo where you send out a single glove and tell the recipient that they can get the other one if they come by the booth. 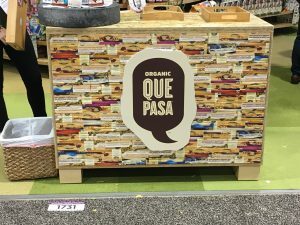 There are literally thousands of things you can come up with that can be used in conjunction with an active, well-thought-out and well-executed snail mail marketing program that’s specific to your upcoming tradeshow appearance. 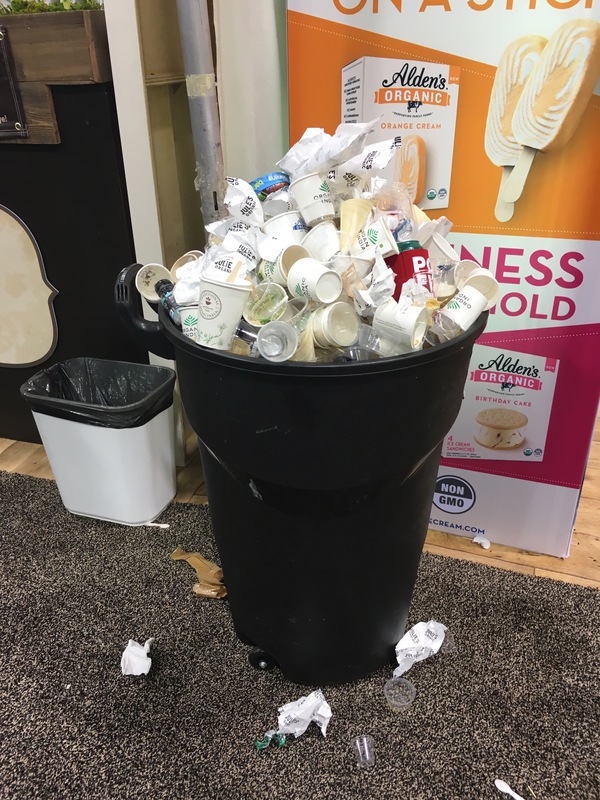 Given that we know how many different balls you have to keep in the air, is it even possible to stop feeling overwhelmed when it comes to managing your tradeshow program? That depends on how you personally deal with things that can come at you like a full-on firehose – we all deal with things a little differently – but let’s explore a few ways that might assist with your state of feeling overwhelmed. Plan your day. I don’t do that as often as I should, but when I create a list of todos prior to the start of the day – even the night before – I move through that list with ease and confidence. By taking some quiet time before the day really kicks into high crazy gear, you’ll have a much better handle on the tasks at hand. Prioritize. Yes, we get pulled every which way by calls, emails, bosses, meetings, customers and clients and more. This can definitely add stress to your day. Priorities should be made weeks or months ahead of time so that you know your overall, important goals, and use them as a template to figure out your daily priorities. Use technology to your advantage. Today’s technology gives us more flexibility than any of our forebears, but only if you use it correctly. Embrace the use of technology and use it where it makes sense (working from home or remotely, anyone? ), and avoid getting sucked into another 30 minutes of social media bait-and-response. Work it out in chunks. Often tradeshow projects come at us in big chunks. Lots of shows, little time between some of them, major and minor changes that need to be addressed. And so on. Carve out the easiest chunk, do that, carve out another chunk, tackle that, and keep going with that idea of parceling out the various bits and pieces instead of getting overwhelmed by the big picture and looming deadlines. Know the real deadlines. Tradeshows are closer than they appear in the calendar. The best way to not get overwhelmed by approaching deadlines is to complete a lot of tasks before you ever really need to. 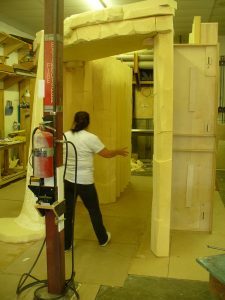 For example, one client I work with wants to upgrade their booth in a pretty major way for next year’s show. We could wait another six months to get started, and still have plenty of time. But we ended up scheduling the first planning meeting a mere two months after the show – ten months ahead of the upgrade’s debut – and will likely have it done months ahead of time. No sweat and everyone’s happy. Delegate. How much do you really need to do yourself vs. how much to you pass on to someone else? Certain tasks can easily be passed on to someone else. Just make sure you’re not adding to their state of being overwhelmed! Write it down. Some people work better with to-do lists in front of them. If that means you, writing things down will give you a visual reminder of what you’ve accomplished and what you have left to do today. Clear and concise communication. Whether you’re meeting in person, speaking on the phone, or communicating via email, be as clear and concise as you’re able. Before clicking “send,” read and re-read the email. Take out unnecessary words, edit like a high school English teacher, and then click. Before speaking, know what you’re going to say. Most of us spend time NOT listening but preparing to respond. If you paid more attention to what someone is really saying – and what they really mean – your response will be more thoughtful. And probably less knee-jerk. 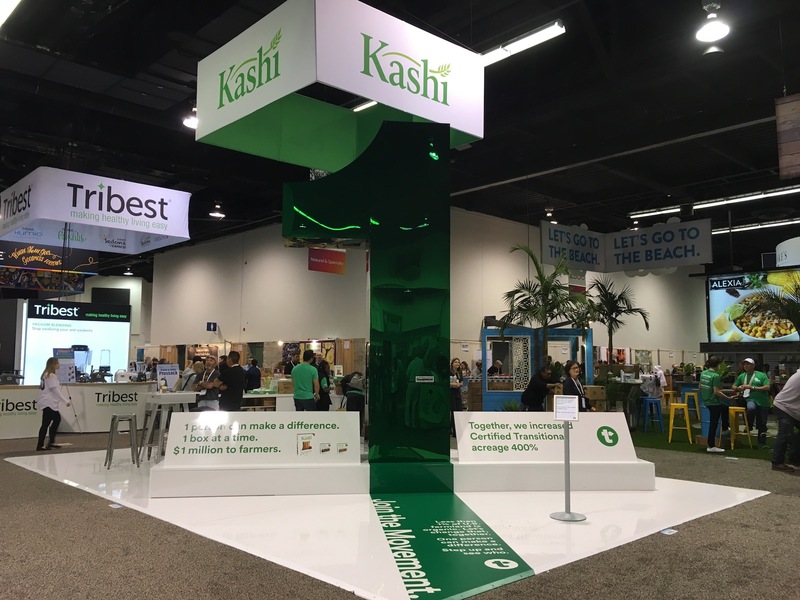 What can you do to keep from being overwhelmed in your day to day tradeshow adventures? “Oh boy, I have a lot more to do. It seems to be never-ending,” said one person, who said he was about a third of the way through his list a month after the show. Frankly, tradeshow follow up can be a bit of a slog. A grind. A long haul. But it’s got to be done! But you’ll never know the full results of your tradeshow appearance or attendance until you complete the follow up. “Complete” follow up may be a misnomer; I suspect that most people never get through the complete list of people they are intending to follow up with. But like a good Harry Bosch novel, it ain’t over until the last page, your follow up ain’t over until you’ve talked to the last person. Given the difficulty of making all of those calls, and connecting with all of those people, here are (x) tips to help you get to the last page of the novel, er, uh, the end of your call list. Set aside a time to call. Most of us wear a lot of hats, and finding time to make those calls is hard, unless you plan for it. Budgeting for the time, blocking it out and committing to it, are the basic elements of making sure you at least get the first step done. Put it on your calendar, put in a reminder notification, and make it happen. Block out everything else during this time. I find it works best to turn off the email program, and perhaps even shut the door to your office if you have one. 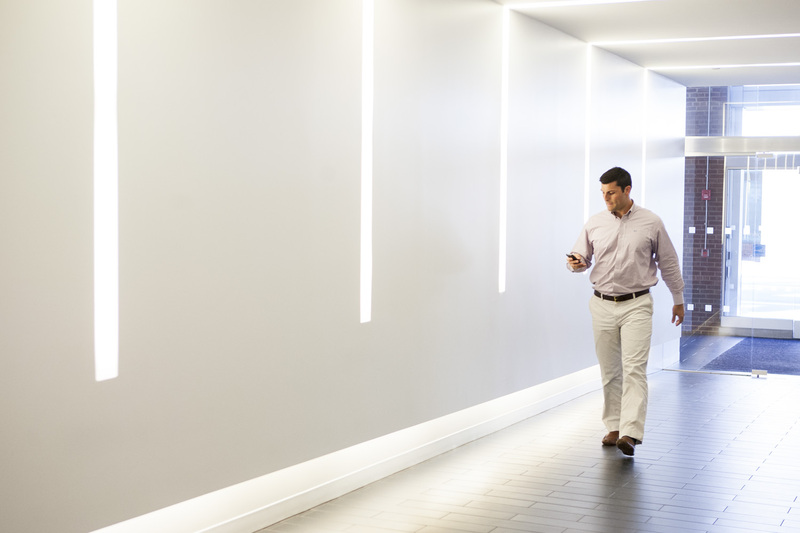 If you’re in a more open office environment, make it clear to colleagues that you’re carving out this time and would like to have that time as uninterrupted as possible. Know your goal of the call. Are you trying to sell something that can be sold in one call? Are you looking to have a brief call and if there’s interest to move forward, schedule a second, more in-depth call later? Whatever your goal, don’t hang up until you’ve either determined there is no “there” there (no chance of a sale), or that you both agree on what the next step is and when. Be consistent. Hell, be a pest. I am. I even tell people that I’m a pest, but a nice pest. The response I get when I say that is something like a laugh and then, “No, that’s okay – I really do need to talk to you – please keep trying to get me.” They admit that they’re hard to reach and they don’t always return calls. Understand that virtually everybody you talk to is probably overworked and they have a to-do list that’s longer than they’ll get to in the foreseeable future. But if they really are interested in what you are pitching, be consistent. Stay in their radar. Send an email if they can’t be reached via phone. Be available at unusual times if you are really having a hard time connecting and have expressed a genuine interest in your product or service. Offer to take a call after hours, or before the office opens. It’s not about you. Don’t take it personally. If you get rejected, it’s not because of you. A hundred different reasons may be affecting the prospect’s ability or interest to engage with you. Those reasons could be financial, personal, business. You really don’t know what they’re going through, so just move on. Sales follow up can be a bummer if you take it personally. But if you make a lot of calls and develop the prospects you have into genuine leads, you’ll have plenty to do. Never give up. I’ve put certain prospects and even former clients on the back burner for years but have never completely given up on the idea of getting them as a client, or back as a client again. Things change. They always do. People move within a company; they move to other companies, a company’s goals and budget will change. Just because they said no once or twice doesn’t mean they’ll say it forever. You might think it’s easy enough to determine your tradeshow marketing goals. Just sell sell sell – increase your business and you’ve done the job, right? But in fact, it’s not be as cut and dried as you might think. Every show is different, and your goals may vary significantly from show to show. And some goals are very specific while some are broader. All of these are laudable, and all are doable. But doing them all at the same show is probably asking a lot, unless you have a thorough plan and the personnel to execute the plan. Even if you’re going to attempt to check them all off at a single show, it’s better to prioritize. You may know your goals going into a show, but it’s still a great exercise to sit down with your team, especially if you have new members, and identify and clarify those goals. 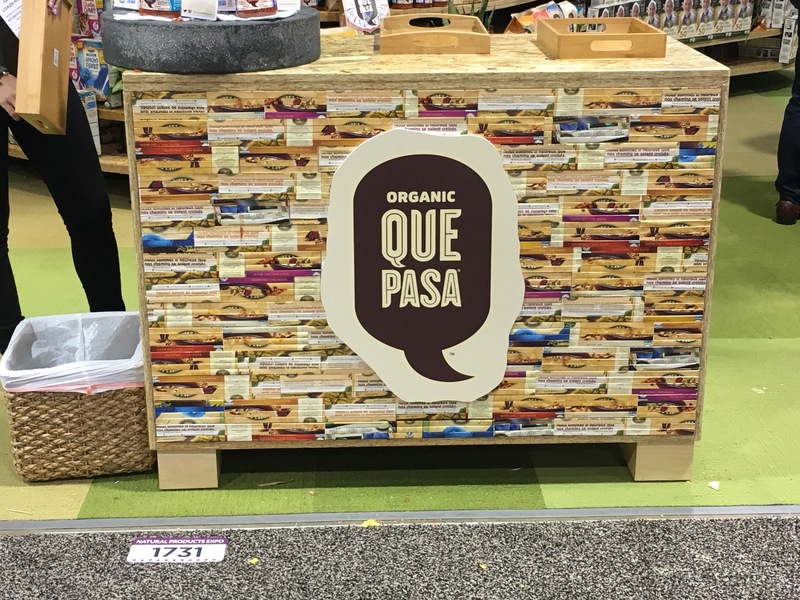 Tradeshow marketing is a significant part of a company’s marketing budget and those dollars should be spent wisely. During your discussion, break down the various parts of the goals, figure out what steps are needed element, and assign those pieces to team members. 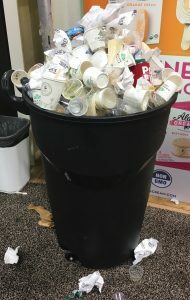 It may mean coming up with some premium giveaways for current customers to show them you care, to determining how many samples are needed for giveaway; from knowing what your competitors are doing to having a good preshow marketing outreach to get the right people to your booth for the right reason. 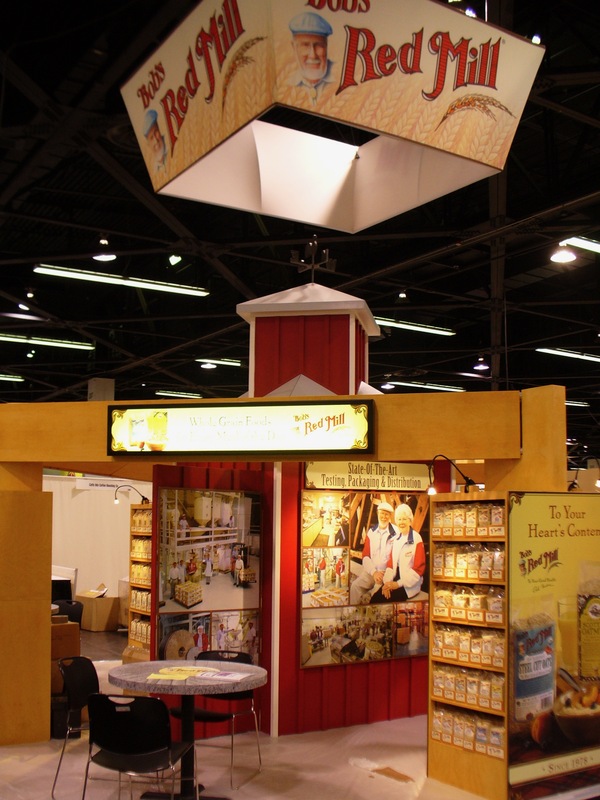 Brand building and tradeshow execution means brand consistency throughout your various platforms. Plug any holes and iron out any deficiencies. Once you have your specific set of prioritized goals, communicate that to your team so they understand the show’s specific objectives and how they tie in with the company’s overall marketing strategy. Goal setting isn’t hard – it just takes some time and thought. Finally keep in mind, a goal should follow the S.M.A.R.T. plan to be effective. In other words, Specific, Measurable, Action-oriented, Realistic, and meet a Timeline. Tradeshow Superheroes and Exhibiting Zombies Are ON THE WAY! 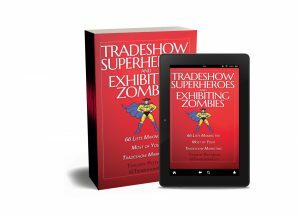 The release date of May 1, 2018 has been set for my new book, Tradeshow Superheroes and Exhibiting Zombies: 66 Lists Making the Most of Your Tradeshow Marketing. The print proof copy just came in and it looks great, and heck, I can’t even find any major errors in it! Thanks to all who helped, from Jesse Stark who did the illustrations, to Mel White at Classic Exhibits (and his wife Mary) who went through the manuscript with a fine-tooth comb, to the great team at CreateSpace who are always on top of their game and to all else who lent support and good words (Ken, Andy and Anders, I’m thinking of you! And Roger too!). Lists. A lot of them. 66 lists, in fact. Corralled in chapters such as Budgeting, Buying an Exhibit, Preshow Marketing, Postshow Follow Up and more, it’s a compilation of a lot of the lists that have appeared on this very blog since 2008. Not all of them, though. Some were outdated. Most have been revised and updated. The people I’ve shared the manuscript with have told me that it’s a fun and quick read, with lots of different topics and lists that can be digested deeply, or skimmed to pick up a tip or two or three. I’ll be creating a Thunderclap promotion to release on May 1, so watch your social media outlets for that. And if you subscribe to my Tradeshow Superheroes book update list or the TradeshowGuy Newsletter, you’ll learn how to get involved in that little thing. All in all, I’m excited! Damn! A new book! And this week’s ONE GOOD THING: SPRING! Seriously, you could compile a list of 50 tradeshow best practices and still add to the list. For the sake of brevity, let’s whittle it down to a reasonable number and see what we get. Create your marketing plan based on the specific event where you’re going to set up your exhibit. Different audiences, different competitors, different goals will all help steer you to a marketing plan that fits the situation. One size does not fit all. Your promotion item should be a natural fit with your product or service. Give away an embossed flash drive if you’re in the tech industry and want people to remember what you do. Give away a letter opener if you pitch direct marketing via mail. Things like that. Try to have some activity in your booth space. People are drawn to movement, or things they can get personally involved with. 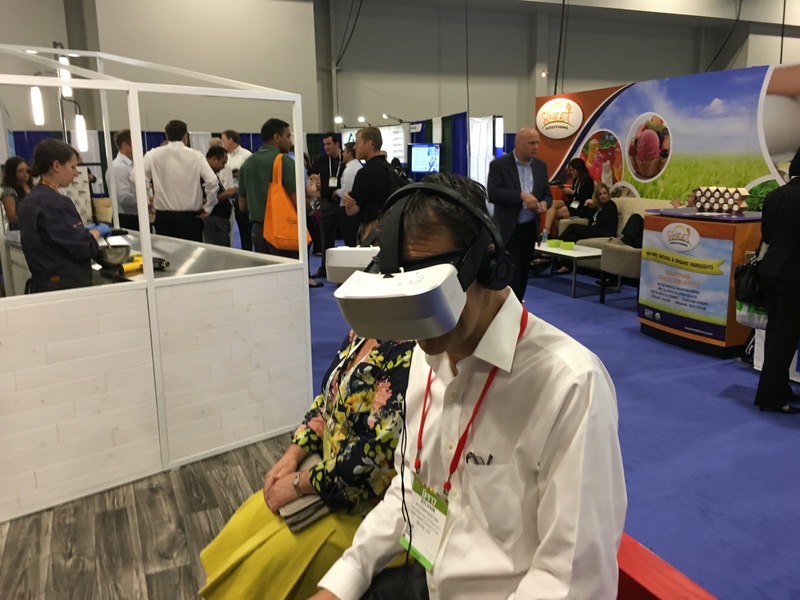 And when you have lots of people playing with something in your booth that relates to your product, that crowd draws a crowd. Prior to show floors opening, have a brief meeting with your staff. Remind them of the show goals, hand out kudos for work well done, and gently remind those who are perhaps coming up a bit short what they should work on. Graphic messaging on your exhibit should be clear as a bell. The fewer the words, the more distinct your message. The message should be enhanced with an appropriate image that supports the message. Follow up on leads in a timely manner. Your lead generation and follow up system should be something that you continually work to improve. Warm leads that are followed up on right after the show will produce more results than those that are weeks old. Qualify and disqualify your visitors quickly. Unqualified visitors should be invited to refer a colleague and be politely disengaged. Qualified visitors earn more time to dig deeper into their needs, including the time frame they need the solution your product can solve, their contact information and an agreed-upon follow up schedule. The power of a professional presenter cannot be understated. Some products and shows lend themselves more to presenters than others, but a good presenter will make it work in any situation and will bring in more leads than not using them. Caveat: if you hire a presenter, you must have a staff that understands and is prepared to deal with the additional leads generated. If not, most of the leads the presenter generates will slip away. Tradeshows are a marathon. Be alert, but pace yourself so you can make it to the end of the last day still upright and able to fully engage with visitors. Spring for carpet padding / wear comfortable shoes. You can never say this enough! Spend more time on pre-show marketing than you think you should, or more than you’ve done in the past. It costs less and is easier to sell to current customers than it is to sell to new customers. Create a list of current customers, or those who have raised a hand by downloading a white paper, subscribing to a newsletter, or inquired about your services or products over the past year or so. Finally, check with show organizers to see if they can rent the attendee list to you prior to the show.